A small group of travelers help Jesus Christ tell different parables by using a wide variety of games, storytelling techniques and hefty doses of comic timing. An eclectic blend of songs help tell the story of Jesus' life with a vibrant blend of music ranging from fun & upbeat to hauntingly beautiful music that dissolves into the Last Supper and the Crucifixion. Jesus' message of kindness, tolerance and love come to life as we tell the story in a modern day setting... an airport terminal! 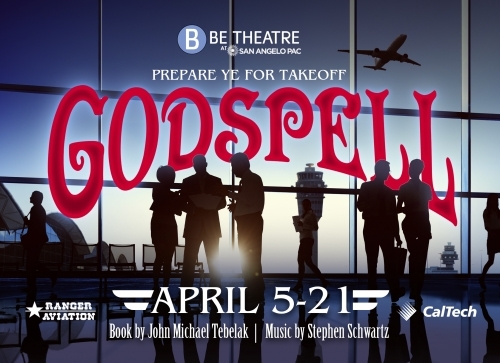 Both youth and adults will be involved in the story and production of Godspell. You may be wondering, why is this logo graphic of an airport? Let's start with the traditional musical. Godspell has often been associated with crazy clothing and clown make up. Written and first performed in 1971, clowning was quite popular at the time. However, we are performing the revised 2012 Broadway version and want to mirror the more modern score. Our vision is to give our audiences an experience that is fresh, modern and more importantly, relatable. When our creative team sat down and discussed the setting, we settled on an airport terminal for many reasons. It's a known fact that some of the best people watching in the world happens at airports. Different people come together with a common interest of travel, whether for business or leisure. And what may happen when mother nature presents a storm that brings an entire airport to a halt? Perhaps we suddenly find ourselves learning more about the people around us. What if one of those people is Jesus? How would you react? Perhaps your soul awakens and a renewed spirit is born? Songs become lessons, bringing light and hope to our audience. The parables many of us have known since we were small children become relatable when woven with song and dance. Then, a hauntingly beautiful last supper melts into a heartbreaking crucifixion in a modern setting. How will it affect you? Our hope is that it affects everyone in a beautiful and different way depending on your experience with us. Godspell ends with an inspiring and beautiful message as a reminder of the hope brought to us by Jesus Christ. As the director, it is my goal to speak to a broad audience despite religious beliefs or background. Jesus loved everyone and spread his message of kindness and love during his time here on earth, and to this very day. We want everyone to share in this joy filled musical and walk away feeling inspired. Join us for an unforgettable theatre experience!